I made this, thanks to inspiration from a fellow junker. I took a long narrow old window and simply added 4 table legs (they don't even match) and old trim as skirting between the legs. I painted the legs and skirting white and left the window it's faded & aged green. Painting took more time than assembly. Here's a window coffee table I made using the same basic design as the one above. then she added lace and decorated it for the Holidays. If you've got the right window, and are careful when hanging it go drill into the studs, you'll have a great canopy for your bed in no time. You can see more of Judy Hill's designs on her web site here. Here is a window shelf made by reader G Collins, from old barn wood and an old antique window. Here are a few pic of a cabinet that I made with an old window as the door. Pretty much used the window as a starting point and built around it. here is a photo of an old window I got at the dump. I painted it and sanded it and then put an old blackboard in it (I know it looks kind of like a mirror)that I found in our basement when we moved in. Then I nailed some horseshoe nails in the bottom so I can hang my keys on it. Hope you like it.....jenniferG Thanks Jennifer and what a great way to re-use "free" items. I found this old chippy window screen frame last weekend at a garage sale. I also found a chippy cabinet door at the same sale. I sawed the cabinet door long ways and made 2 shelves. I attached the shelves to the frame and made some support brackets out of scrap from that same cabinet door. I left all of the door hardware on the wood to add to the character of the piece. close up of lower shelf, you can see the glass knob. The ultimate use for old windows, A Cat Perch. Kim did this quick project for her Daisy Cottage: "This old window pane was one of many given away for free from a neighbor's home. 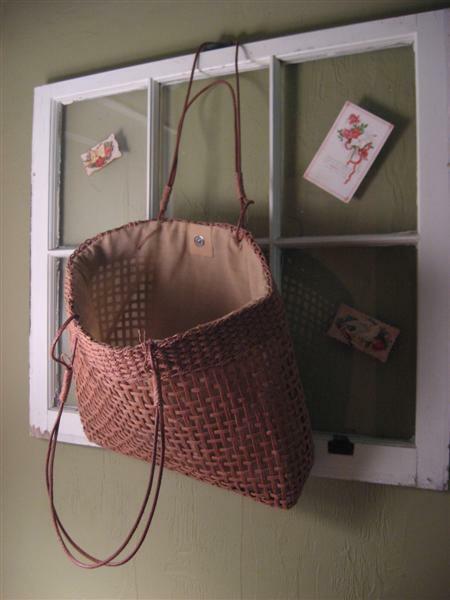 For now, I thought I'd simply tape up a few vintagy cards and hang one of my straw bags on it." These are greenhouses made from old windows. They were designed by Linda Smith of The Blue Gate(see pic on left) in Wills Point, Texas. You can find her wonderful one of a kind garden accessories at Canton Trades Day in Canton, Texas. 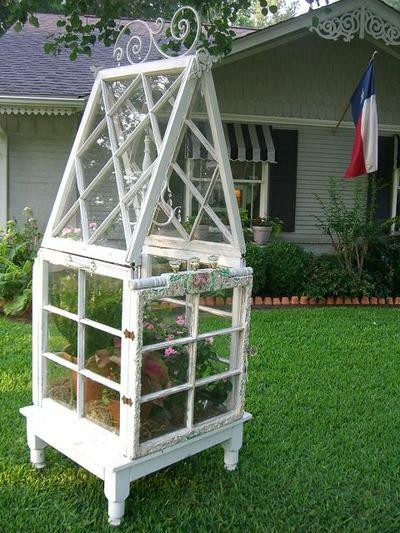 Or you can also contact Linda by phone~ @ 214-686-4338 to commission your own one of a kind cottage greenhouse. I took these pictures at "The Little House" antique store in Marshall Texas. Ginger built these display pieces and I just loved them. Jennifer submits this window project. She writes "this is one of my lastest im decorating my bedroom in my new home beach theme so i bought this poster size picture at a local michaels craft stor 30% off and painted and old window for the frame"
Cindee made this window for her garden. Notice the barbed wire, and the tools on the sides. She added a mirror to replace the glass. I painted one side of each window green,then DH attached the 2 windows together with L-brackets,then he measured the width of the open ends to decide how big to make the box. He used old 1"x6"'s for the sides and old plywood for the bottom. I thinned down some white paint to "white-wash" it,and painted the inside of the box with thinned down green paint. Then he screwed old porch spindles(they were already white,a great yard sale find) on for legs on the outside of the box,screwing them from the inside,turning it into a table. Then the windows were fastened to the table with hinges on the outside of the windows to the box. This window was turned into a pot rack by chonlahan on HGTV Message boards. What a great idea. She has this advise about this project. " It was a pretty simple project. I used large hooks to attach the chain and large hooks to hold the pots and pans. I think the most important thing is choosing a sturdy window and how you secure it to the ceiling. It could be quite heavy and you need to choose ceiling anchors and chain appropriate to the weight of your pans. I decorated on top of mine with ivy, grapevine wreath and a metal bowl of silk roses. I wouldn't use anything very heavy on top of the glass. 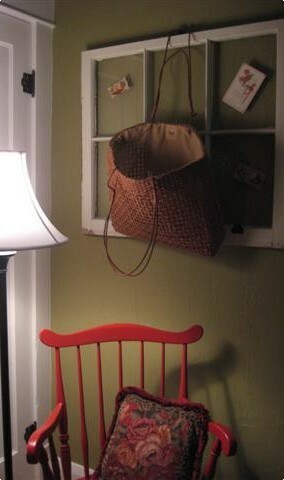 "I Do Rock" from the HGTV Message Board, made this potting display bench from a group of old windows. This is a very large, functional greenhouse made from old windows and shutters by mao_tse_mom over at Garden Web. Caroline from Gardenweb did these great Window Planter Boxes around her pool. Dianne tells about this window project. "Then I needed a visual divider between my vegetable garden and collection of hostas so I took 3 windows (also removed the glass). I positioned them on their sides, hung beads and crystals in the center of each pane and attached them on the top and bottom with 2x4 for stability. They serve as a low wall"
tin ceiling tile was screwed onto the back of the window. The box was made from old door parts. This idea was submitted by Soov. An old window frame has been dressed up with a french feel. jamiet tells the story of this old window. "I have this very high space that I wanted to decorate with a hanging window. I had a window that was too heavy so I traded with a friend for a smaller, lighter weight window. Hers is way cuter than mine, so I feel very blessed that she wanted to trade with me." This idea was submitted by tina56. She took several old window frames and strung them together to make a divider for her outdoor patio space. This old window was hung from Robolady's porch for an unusual visual illusion. Afterall who needs a window when you are already outside? This idea was submitted by Tx-Girl. She built a mock wall out of leftover bricks, placed an old window in it and added decorations, to make an outdoor room, and divide her yard from the field beyond.